A Jeeves and Wooster novelThe beefy 'Stilton' Cheesewright has drawn Bertie Wooster as red-hot favourite in the Drones club annual darts tournament - which is lucky for Bertie because otherwise Stilton would have beaten him to a pulp and buttered the lawn with him. A Jeeves and Wooster novel The beefy 'Stilton' Cheesewright has drawn Bertie Wooster as red-hot favourite in the Drones club annual darts tournament - which is lucky for Bertie because otherwise Stilton would have beaten him to a pulp and buttered the lawn with him. Stilton does not, after all like men who he thinks are trifling with his fiancee's affections. Meanwhile Bertie has committed a more heinous offence by growing a moustache, and Jeeves strongly disapproves - which is unfortunate, because Jeeves's feudal spirit is desperately needed. 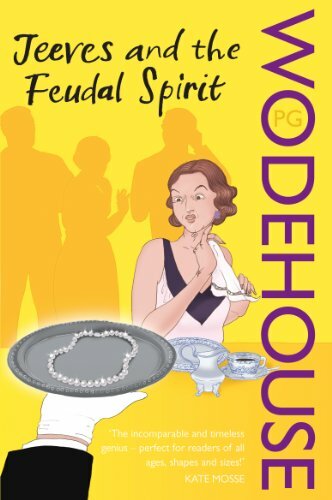 Bertie's Aunt Dahlia is trying to sell her magazine Milady's Boudoir to the Trotter Empire and still keep her amazing chef Anatole out of Lady Trotter's clutches. And Bertie? Bertie simply has to try to hold onto his moustache and hope he gets to the end in one piece.